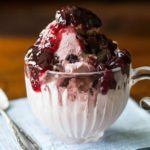 Simple and Elegant Cherry Sauce • Just 5 Minutes to Make! Spring is here! Since the weather is warmer, it’s time to break out the cool treats. Got any ice cream socials planned? If not, you should. 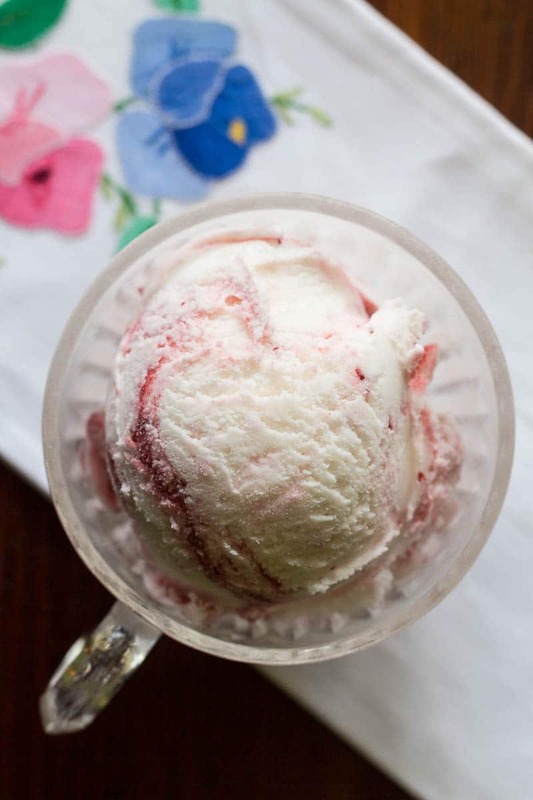 What could be better than a chilly bowl of ice cream enjoyed under the warm rays of the sun? 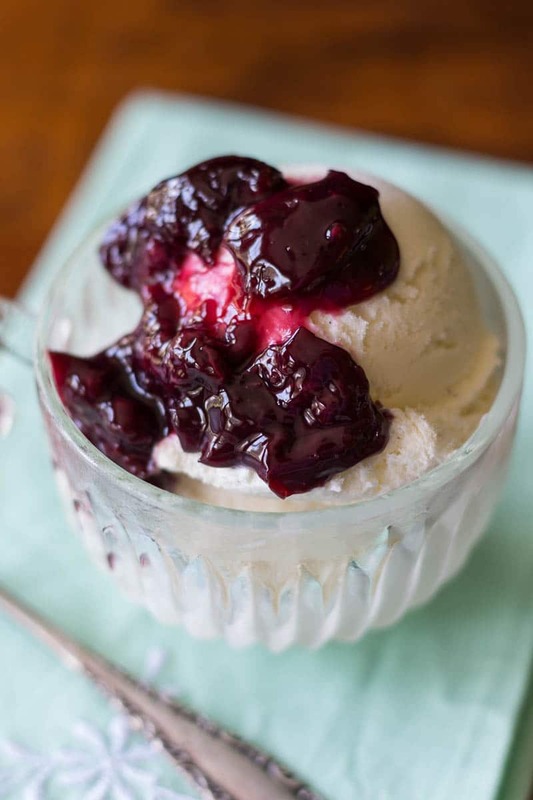 A chilly bowl of ice cream topped with cherry sauce enjoyed under the warm rays of the sun. I have to admit, when I went to Walmart to pick up the Blue Bunny® ice cream I needed, I was floored by the sheer variety of available flavors. Sure, there’s vanilla, chocolate, and strawberry, but there’s also Blue Bunny® Cherry Pickin’ Chocolate, Super Chunky Cookie Dough, and Toasted Almond Fudge, just to name a few. 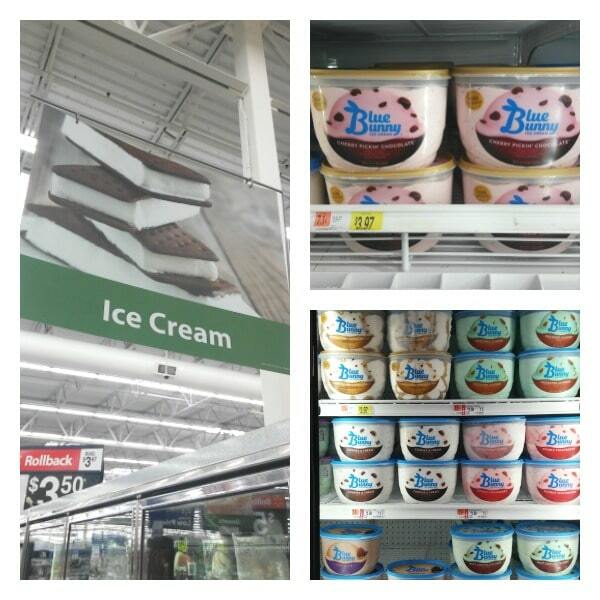 You can pick up your Blue Bunny® ice cream from Walmart in the frozen foods section. Look for the clear new container, in which you can see all the colors and swirls of each flavor of ice cream! 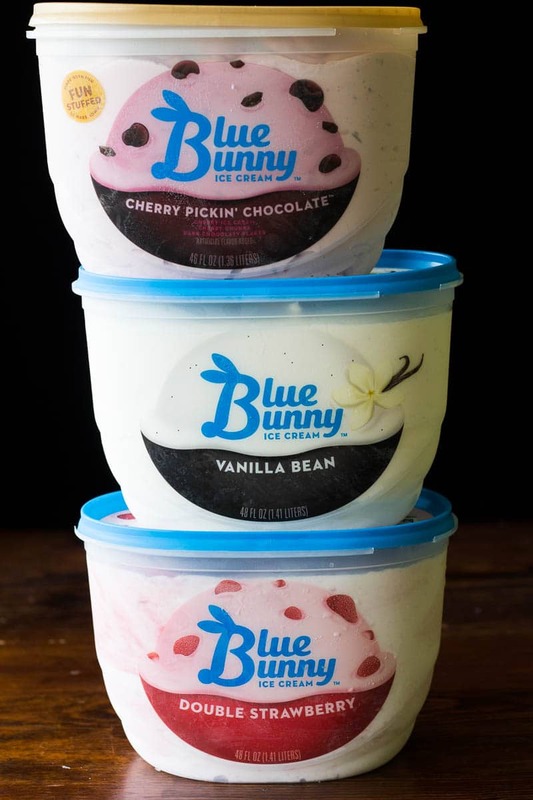 Although it was difficult to choose, I settled on Blue Bunny® Cherry Pickin’ Chocolate, Vanilla Bean, and Double Strawberry. I’ve always loved cherry sauce. I had it at a restaurant on my birthday once, and ever since then I’ve wanted to duplicate its deep color, rich flavor, and perfect texture. I’ve spent some time working on it and I think I’ve come up with quite a good version. 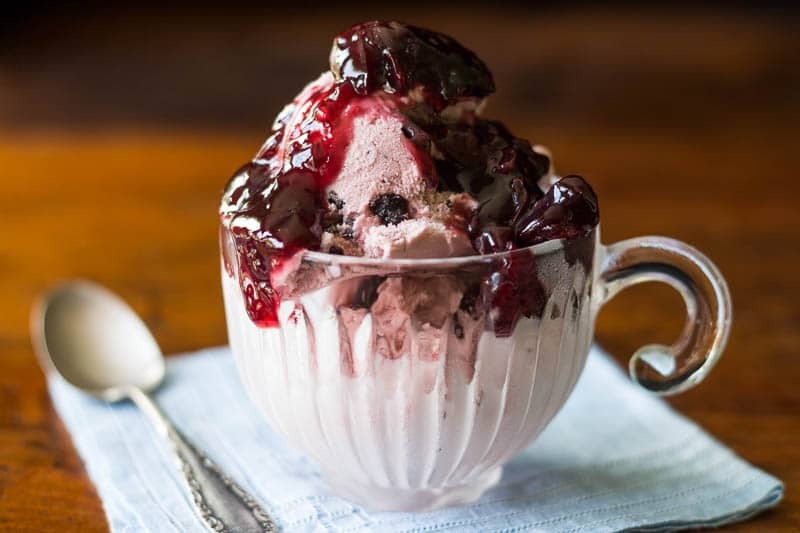 You can use this cherry sauce to top ice cream or sundaes, and it’s also versatile enough to pair very well with cheesecake, brownies, and other sweets. Its cheerful color will bring a happy note to any springtime gathering. You can create an entire ice cream social with all the flavors of Blue Bunny® ice cream plus your favorite toppings! 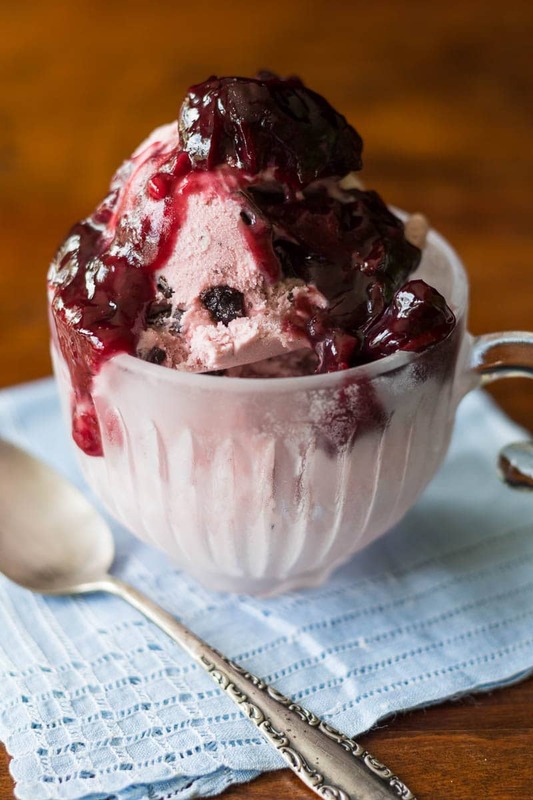 This recipe was tested with frozen cherries. If you use fresh cherries, watch the pot more closely to avoid cooking the cherry sauce into mush. Even if it doesn’t look thick enough, do not add more cornstarch later. You’ll end up with lumps of cornstarch. The sauce will thicken as it cools off. The tiny amount of kirsch is optional. It’s also flexible. I have substituted rum, brandy, and wine successfully. Make this beautiful cherry sauce with just a few simple ingredients. Perfect for topping ice cream, sundaes, cheesecake, and more! Combine the water, lemon juice, kirsch, sugar, salt, and cornstarch in a small pot. Whisk until smooth. Add the frozen cherries and stir. Bring to a boil over medium heat and cook for 5 minutes, stirring occasionally. Remove from heat and let cool. If you want to serve it warm, you may do so; simply let it cool until it is warm, not hot. Cover and refrigerate to store. Get more Blue Bunny® inspiration! I have never thought to make my own dessert topping like this before!! This looks so good we go through a lot of ice cream in the summer time, my favorite treat. I love that there are so many ways to change this up. It’s just so darn simple, I don’t know why I haven’t been making it for years! Nothing beats a fresh dessert topping! I love Ice Cream and I sure do love cherries as well. We live in a high cherry producing location in the Pacific Northwest so I think this is something that would put those to use perfectly!! Sadly now I want Ice cream and it’s only 8 am…. Ha! I do that all the time. I see something good at 8:30 am and I start wanting lunch! What an amazing dessert! Cherries are such a great summer fruit too! We will definitely have to try this out with the ice cream too! Oh my heavens! This looks amazing. I’ve never tried this brand of ice cream, but it looks so creamy! The toppings you add to is takes the cake! Thanks for sharing. This looks so easy! I plan on trying it out with crepes.